Jakarta photographer Ilham Anas, in full President Obama persona with reporters in tow, tours the school the real Obama attended as a boy. Striding purposefully, his smile lighting up a rainy afternoon, Barack Obama appears to have arrived to tour an elementary school he attended as a boy. But wait. It& #39;s not him. The US president is back in Washington, D.C., shepherding his health-care bill toward passage. He& #39;s Ilham Anas, 34, a teen-magazine photographer who has parlayed a striking resemblance to Obama into his own brand of celebrity and wealth. Since his sister told him in 2007 that he looked like the then-presidential candidate, Anas& #39; face and megawatt smile have been seen on Southeast Asian TV and the Internet, pitchingover-the-counter medicine and other products. He has also appeared on his nation& #39;s premier television-talk show and had a cameo in a movie, all while fielding offers from marketers across Indonesia, Singapore, Malaysia and the Philippines. Anas is the first to admit it: He& #39;s an impostor. But he& #39;ll also tell you this: He& #39;s in incredible demand. "I& #39;ve got so much work I can& #39;t handle it all," he said. He& #39;s even penned an autobiography, "Because of Obama." The jacket review says Anas& #39; resemblance to the president has "turned his life around 180 degrees." It hasn& #39;t been easy. When his sister first mentioned the resemblance, Anas said, he dismissed it. "I said: & #39;Nah. I don& #39;t care.& #39; "
Then a colleague at the magazine asked him to pose as Obama wearing a power suit, in front of a U.S. flag. At first he refused. "I told him that I& #39;m a photographer, not an object for the camera," he said. As soon as he relented, his career took off. The married father of two children is rarely home these days. On a recent day, a horde of reporters followed him on a tour of the elementary school Obama once attended. Anas sat in the classroom where the future president studied. He mugged for the cameras and spoke a few lines in English. The moment he opened his mouth, however, the differences became apparent. "Obama is a baritone," Anas said. "I& #39;m not. I sound like a little boy." He is also shorter than the president. But he makes up for that by practicing Obama& #39;s mannerisms. Before public appearances, he said, he spends hours in front of the mirror posing, gesturing, flashing that smile. Otherwise, Anas said, he hasn& #39;t altered his appearance much for the role. 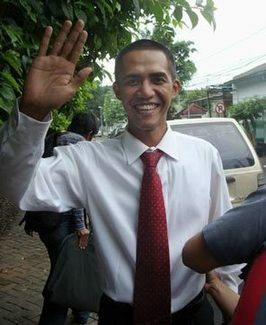 He wears his hair just like he did in high school in Bandung, a few hours& #39; drive from Jakarta. But he did shape his eyebrows to look more like those of the president. Anas said he used to view his reflection and not like what he saw. Now he no longer sees an average guy. Now he sees a superstar. Meanwhile, offers continue to flood in. So Anas will keep posing, smiling and cashing the checks. For now, he is keeping his own brand of hope: that Obama will win a second term in the White House. "The longer he& #39;s in office, the longer my 15 minutes of fame will last," he said.